Mention Christmas and it conjures up images of kids frolicking in the snow, people wrapped in thick winter clothes and, of course, Santa Claus as he shimmies up and down chimneys bearing gifts for all. Now, picture yourself in sun-drenched New Zealand experiencing a Yuletide holiday the Kiwi way: kids romping around the beach, relaxed barbecue picnics filled with folks dressed in T-shirts, shorts and flip-flops. Yes, it’s summer in Kiwi country from December to February, where average temperatures range from 20-30ºC. 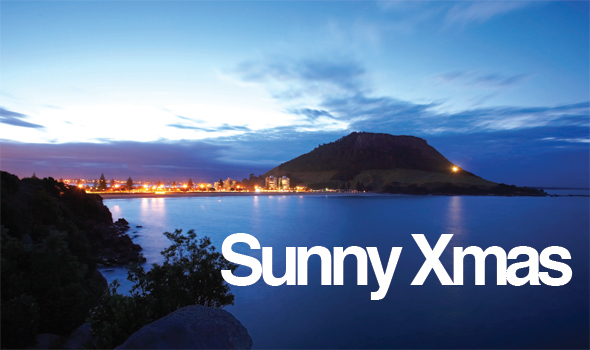 Christmas and New Year celebrations in New Zealand offer a summer twist on the traditional festive season. As temperatures begin to rise, December starts the countdown to the holiday period, which is marked by barbeques, outdoor music festivals, summer sports and an en masse migration to the beach. The festive focus is on the outdoors as Kiwis wind up business for the year to enjoy Christmas holidays of long, hot sunny days, when the summer days don’t often end until 9:30 at night. With its crimson red flower fluttering in the wind, the Pohutukawa tree has become an established part of the New Zealand Christmas tradition. This iconic tree, unique to the New Zealand’s demographic, has become an important symbol for Kiwis at home and abroad, and are often featured on greeting cards and in poems and songs. 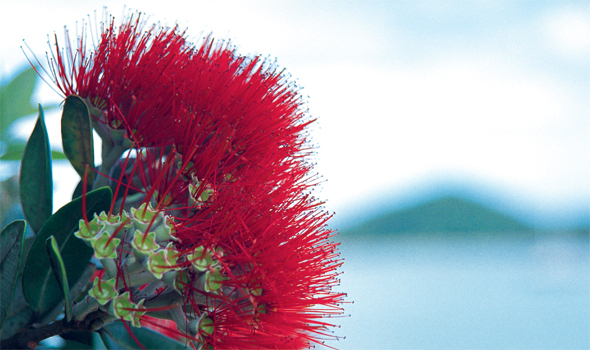 Renowned for its vibrant colour and its ability to survive rough terrain, the Pohutukawa is important not only to modern New Zealanders, but also to the Maoris who venerated the tree for its spirituality, strength and beauty. The Pohutukawa is considered one of the “chiefly trees”, the rakaurangatira. Upon death, the Maori believe that the spirit travels to the Pohutukawa tree which sits on the very tip of Cape Reinga, at the top of the North Island. The spirit then slides deep underground into the roots of the Pohutukawa, before finally emerging onto Ohaua for a final farewell before rejoining the ancestors. New Zealand is one of the first few places in the world to welcome the New Year. 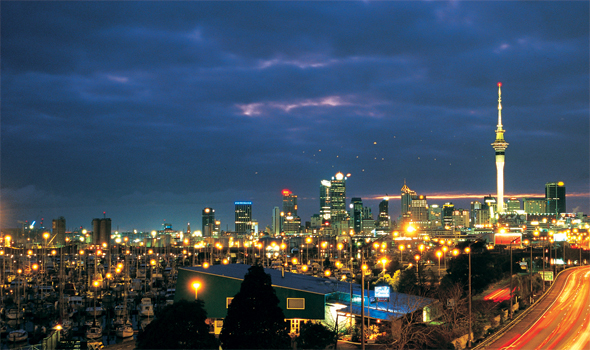 Auckland’s Sky Tower traditionally has a fantastic fireworks display that doesn’t disappoint. New Year’s Eve is party time in New Zealand and many of the country’s premier music festivals are held at popular coastal settlements. The best-known event is Rhythm & Vines, a three-day outdoor festival set in a vineyard in Gisborne on the east coast of the North Island – the first place in the world to see the sun each day. More than 20,000 people gather to hear bands from all over the world and see the New Year in at a typically Kiwi outdoor event. This year Waiheke Island (30 mins by ferry from Auckland) has a huge party called HighLife NYE right in the sprawling Stony Ridge Vineyard. Many popular New Zealand music artists and bands also team up and spend the Christmas and New Year period touring local pubs and bars across the country. Touring information is usually available at the bars or in local newspapers. Do something different this year. Pack light and head to New Zealand’s many gorgeous beaches and outdoor hot spots. It’s a perfect time to go diving, surfing, sunbathing, or taking a road trip around the vineyards, fruit orchards and olive grove. If you’re still looking for adventure, try your hand at any number of adventure sports around the country. 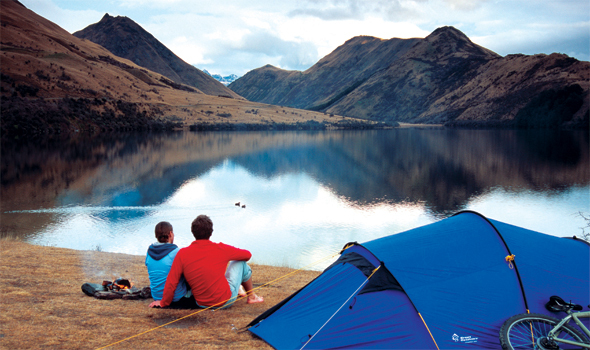 A popular holiday option for many New Zealand families and groups of friends is to rent a house or pitch a tent in a camping spot. Bachs, found in the southern part of New Zealand, refers to structures akin to small, often very modest holiday homes or beach houses. They are an iconic part of New Zealand’s history and culture, especially in the middle of the 20th century, where they symbolized the beach holiday lifestyle that was becoming more accessible to the middle class. Matariki is the Maori name for the small cluster of stars that can be seen low on New Zealand’s northeastern horizon just before dawn in the last days of May or in early June. The first appearance of these stars, which are also known as the Pleiades or the Seven Sisters, heralds the beginning of Maori New Year celebrations. All Iwi (Maori Tribes) celebrate Matariki, although they may celebrate at different times. Some tribe celebrations are held when Matariki is first seen in the dawn sky, while others celebrate after the full moon rises or at the dawn of the next new moon. Traditionally, Matariki was an opportunity to honor the past and plan for the future. The coming season’s crop is thought to be determined by the visibility of Matariki. Many people believe that the brighter the stars, the warmer the season will be, thus ensuring a more productive crop. Today all of New Zealand celebrates Matariki. It has become a time to rejoice in the remarkable country they live in; share kai (food), stories and songs; create art and enjoy cultural entertainment. Looking for more ideas? Check out this handy guide on the 14 Must Do Things in New Zealand.